On a field Azure, five barrulets wavy Or each in chief and base, are respectively charged with a stone fish tail haurient and urinant. The sets of wavy bars represent the Sea, arranged to resemble a grand staff of music. 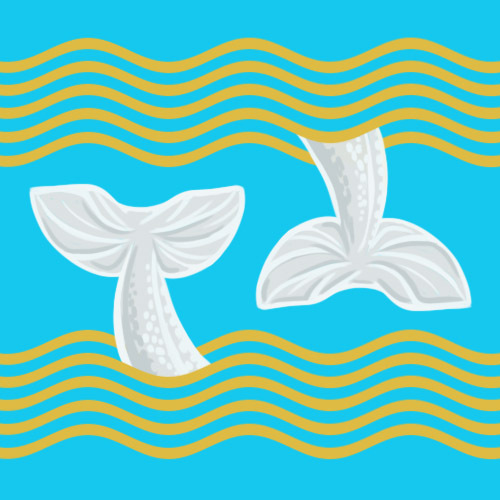 The fish tails symbolize the importance of the House's relationship with the Sirens, as well as the House's duties above and below the waves. The stone appearance of the tails indicates Mairwen's fame for sculptures. Mairwen manages to distinguish itself amongst the minor houses with its focus on fine artistry in all forms. While its members may claim no great political ambition, they are called upon as speech-writers and public representatives, for their keen sense of performance and poetic turns of phrase. Not only that, but the family lines are infused with more than a touch of Siren blood, it seems. The Mairwen Choir draws crowds with the emotionally inspirational quality of their singing. The natural talent runs to the fine arts, glass sculpture and stone-carving mainly, however even those feeling the call of the pen or paintbrush have found avenues by which to pursue their ideas. The raising of the Mairwen family line to noble status was officially recorded as a token of esteem by the first Queen Under The Waves, Manawydan, in the thick of The Triton Wars for their inspiring compositions and artistic commemoration of her successes. Further snooping and interviewing the right historians will turn up strong suggestions that the move was done politically to appease the Sirens, whose blood runs rife in the family ancestry. An even deeper, and more subversive, theory is that granting influence and title to the Mairwens and their ancestral home geographically mitigated the alliance between the Tritons and the Gailes. Whatever the truth, the House has continued to prove its worth in cultural matters, and has also claimed to be 'instrumental' in luring Leviathan back from his Lyonesse rampage to slumber once more in the Soldieve Deeps. Mairwen's family holdings are within a valleyed region beyond the Great Kelp Forest, and far removed from the other territories. Its strategic value lies in its proximity to the Sea Shadowpaths to Jade and Lyonesse. Within the capital, the family keeps an elegantly built townhouse on one of the highest cliffs of the Upper City. A number of artisan studios within the business sector can be visited to commission works of art or architectural designs. As the Mairwen Holdings are isolated, the House has fostered fairly benevolent relations with the reclusive Gailes inhabiting the cracked undersea plains to the southwest. Their creative understanding of the emotions and interplay between colours has aided this friendship greatly. The charismatic Mairwens are generally liked by the other Houses and Royalty, despite their involvement in helping one or another House get ahead through dramatic pointers in presentation. Vialle - Blind artist and accomplished Mirror Mage, ordered to be married to Prince Random, now lives in Palace Amber. Note: Feature Character. Vialle's father (name TBD) is rumoured a member of a Cabal of Mirror Mages.